I was provided with a sample product in exchange for this post. All opinions are 100% my own. 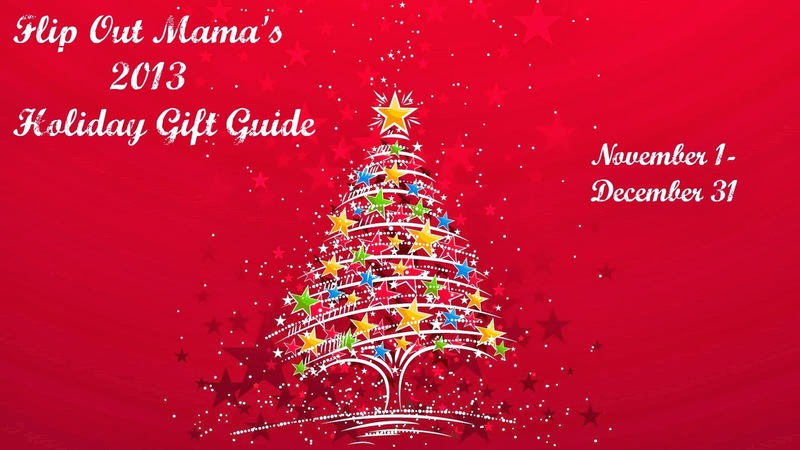 I am really excited to introduce you guys to our first Holiday Gift Guide sponsor, Dog Park Publishing. 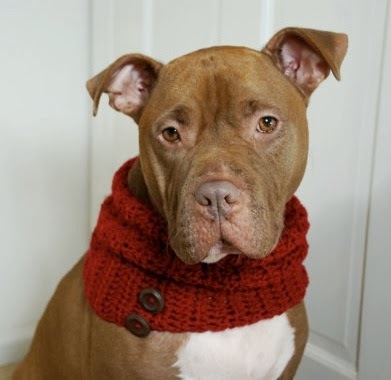 Most of you know that I have a special place in my heart for pit bulls, and I truly believe that they are one of the smartest and most misunderstood dog breeds that there are. 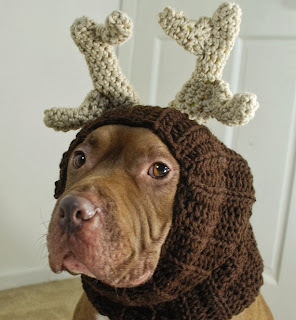 I have always gravitated towards pit bulls, even when I was a little girl, before I knew that they had a "bad reputation". They will always be my favorite breed! The mission of Dog Park Publishing is to showcase and celebrate the Pit Bull, through our calendars and other products, as a majestic, affectionate, and intelligent breed that is sorely misunderstood. We strive to fight the stereotypes facing these dogs by featuring the Ambassadors of the breed and the organizations that support them. Every dog we feature has been rescued from his or her circumstances by a reputable organization or individual. In addition, Dog Park Publishing is doing its part to support shelters and rescues for all dog breeds and mixes. We understand that most shelters are underfunded, while their staff and volunteers work tirelessly for the sake of the countless animals that come through their doors each year. We applaud their dedication. Our company, which advocates that all owners spay/neuter their dogs, donates a percentage of the proceeds from the sale of all of our merchandise to various pit bull rescue groups across the country. 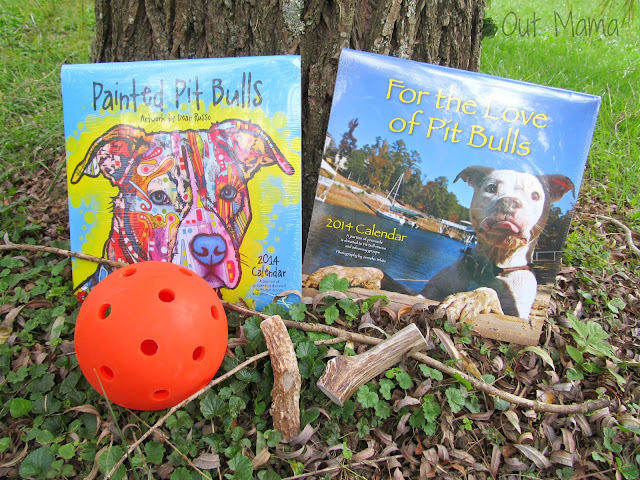 In 2013, as of March 5th, Dog Park Publishing has made in-kind and cash donations of $5,914.10 to pit bull/dog rescues, shelters and organizations. In 2012, our company made in-kind and cash donations of $28,729.18. In 2011, we made in-kind and cash donations of $21,419.15. If you have a pit bull lover (or any dog lover!) on your gift giving list this year, you should definitely consider getting them a gift from Dog Park Publishing. 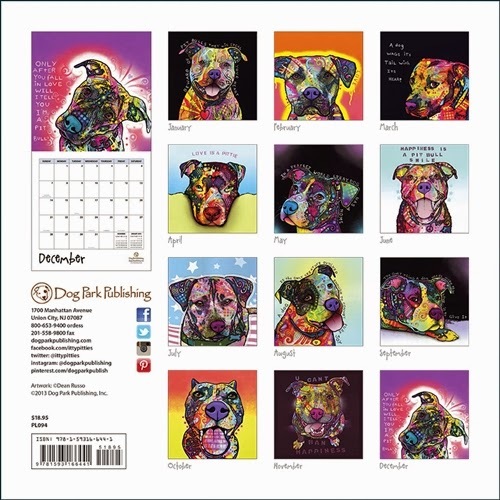 Not only does a percentage of the proceeds go to pit bull rescue groups, but the calenders and other gifts that Dog Park Publishing sells are adorable! 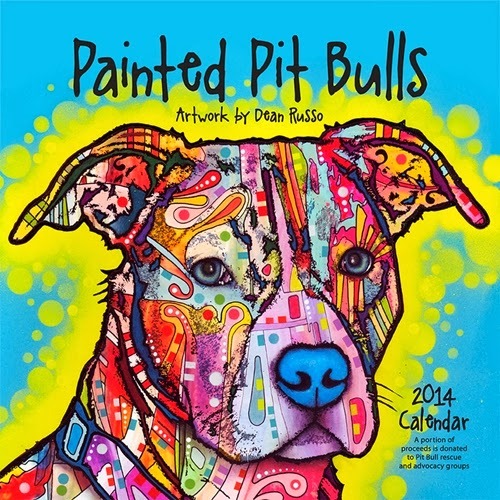 We were sent an awesome gift pack from the fine folks at Dog Park Publishing, including the amazing Painted Pit Bulls 2014 Calendar by Dean Russo. This is truly one of the most beautiful calendars that I have ever seen, and not just because of the adorable pitties inside! I absolutely LOVE this calendar. It is so bright and pretty, and is sure to put you in a good mood if you have it hanging on your wall! 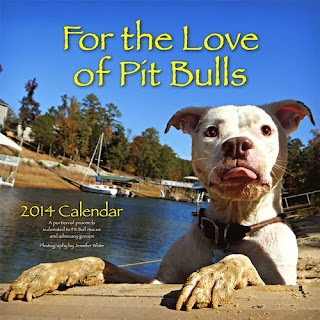 We also got a copy of the For The Love Of Pitbulls 2014 calendar, which has some pretty important "celebrities" covering it's pages. 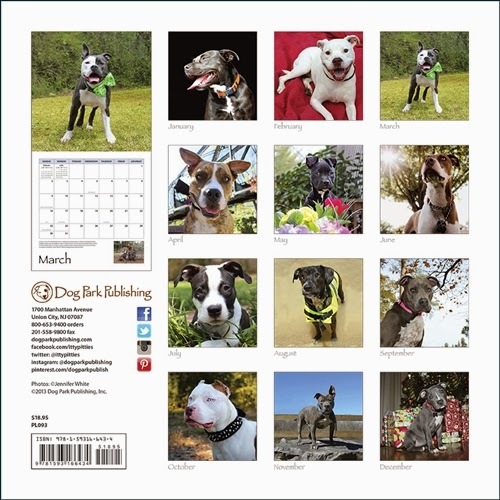 Each of the 12 pit bulls inside the calendar was rescued from a difficult circumstance and is now doing great! I LOVE this calendar as well! It is so sweet, and I love looking at these sweet pups and knowing that they are all in a better place now and doing great! This one is definitely a heart warmer! We also got a few treats too in our package! 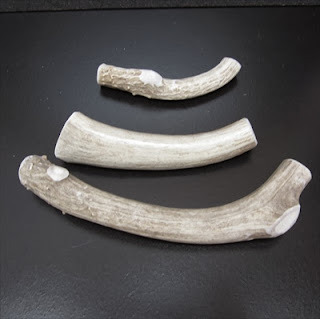 Check out these awesome antler chews! 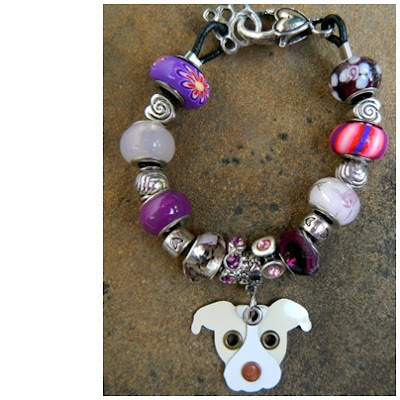 What doggie wouldn't love these in their stocking? And if you have a big puppy who likes to destroy toys, you are definitely going to want to check out the "Unbreakoball"! They are really virtually indestructible and that is awesome! Okay, if you're not hooked by now, you must be crazy! I am such a fan of Dog Park Publishing, their adorable products,and all the good deeds they stand for! I am sure that you guys will be too! Make sure to CLICK HERE to check out their website and all of their adorable products! 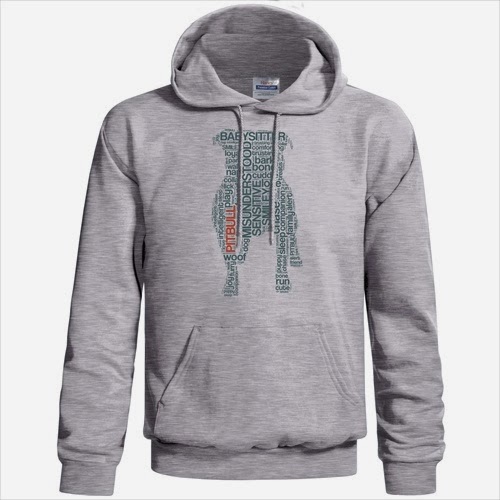 We are also going to be running a great giveaway! 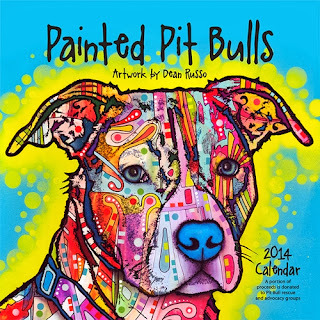 We will be giving away 2 Painted Pit Bull 2014 Calendars and 2 For The Love Of Pit Bull Calenders here on the blog! I will draw for four winners, and the contest will end on 11/10/13 at approx. 11:59 PM EST. 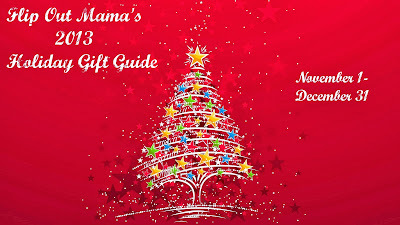 To enter, simply visit the Dog Park Publishing site, then come back here to my blog and leave a comment telling me which product is your very favorite! 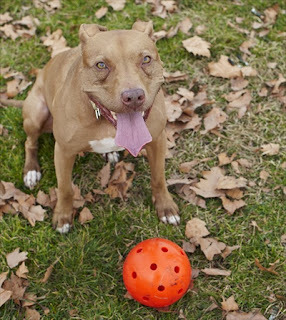 Don't forget to follow Dog Park Publishing on TWITTER, FACEBOOK, and PINTEREST to keep up with all of the latest news from this wonderful company! A huge thank you to the folks at Dog Park Publishing for participating in our gift guide and providing great products for our giveaway!! Go enter, and good luck!